I bought some tea from Ying Kee tea house in Hong Kong. I had purchased their premium golden crown TGY (hk$240), queen peony white tea (hk$40) and phoenix daffodil danchong (hk$120). The total purchase of hk$400 (us$50) made me happy as the TGY is one of my fav TGY. Even though this TGY is slightly expensive (120g), I enjoy the very traditional robust flavor which I do not find in the other TGYs which is lighter and more floral in taste. I will purchase a bag of Ying Kee's crown TGY whenever I am in Hong Kong. It is convenient for me as Ying Kee has 14 outlets and even has one at the airport. The Queen Peony white tea is one of the 6 white teas offered for sale at Ying Kee (see the web site for all products - http://www.yingkeetea.com/index.php?cat=pricelist). One characteristic of white tea is that white tea do not undergo any processing (fermentation, rolling, frying, steaming etc). The tea leaves are harvested and simply left to wither naturally before it is packed for sale. The 'white' in the tea refers to the white hairs on the tea leaves (see pix 2). I find this tea to be very delicate in color, taste and aroma. The brewed tea is light yellow and the aroma faintly floral. When I sip the tea, the taste is very light and I felt the taste concentrated on the back of the tongue. It is really nice and light with a nice tasty sweet sensation.......and I chose queen peony, which was the second most expensive white tea in the shop, as the sales staff told me it had the most robust taste of the white tea range. I was also reminded not to use boiling water for brewing but to allow the boiling water to cool off for 2 minutes before brewing the tea. (she said for optimal taste). This 60g bag of white tea costs me hk$40 (us$5), which I think merits a buy consideration when you happen to be in Hong Kong. Published by Asiapac Books Pte Ltd, this book "Origins of Chinese Tea and wine" attempts to examine Chinese tea and wine with extensive use of cartoons, pictures and illustrations. All major aspects of chinese tea are explored and explained. The stories and folk lore behind different types of tea are explained and illustrated. Practical aspects like storage of tea, various tea customs, brewing and appreciation of tea are discussed and explained. The other section of the box deals with Chinese wine, which I found to be equally fascinating as well. You can see from the 2nd and 3rd pix (click for enlarged views) that the it is not tedious to read the contents and I can appreciate that the concise yet informative information about all things Chinese Tea was clearly explained and the reader can easily understand and be more aware of the intricacies of Chinese Tea. I had purchased this book from a book Shop in Kuching, Sarawak last December and had cost me slightly less than US$5. This 150 page book is a very enjoyable read. The sections on the origin of tea as well as the different tea customs in China was extremely well written and illustrated. I recommend you grab a copy if you come across this book. 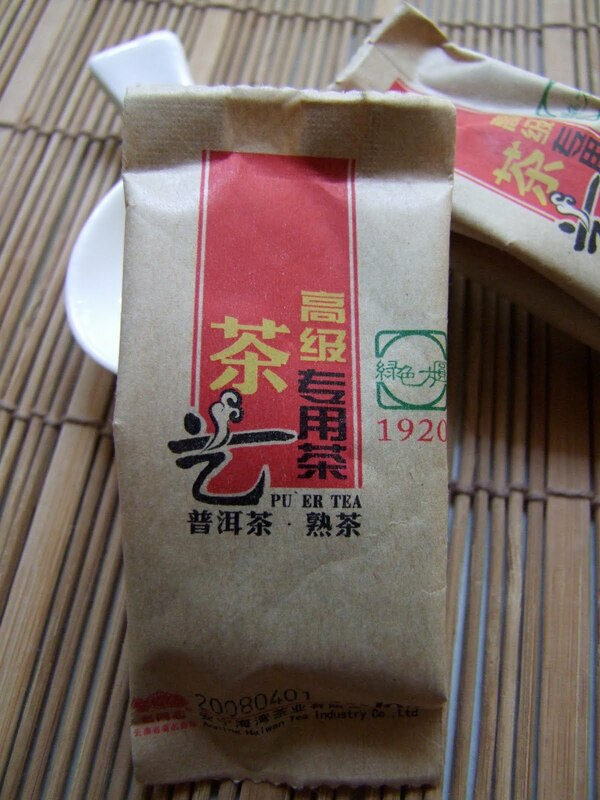 Haiwan recently introduced a 10g pack of loose ripe pu erh. A nice presentation box comprising of 20 of these sachets can be purchased for under US$10. The packaging is good and sturdy. The tea is 'doubled bagged' in the sense that there is a plastic inner lining inside the sachet to protect the tea in the event the outer wrapper gets wet. My guess that 10g of tea was packed in each sachet was to cater to the many tea drinkers whose teapots or gaiwans are varied in size. I myself used a 160ml teapot for my ripe pu erh brewing. Some of my tea friends' teapots for ripe pu erh ranges from 150ml to 250 ml. In my opinion, this 10g Haiwan ripe loose tea is very suitable for a 220-250 ml tea brewing vessel. I brewed the entire sachet of tea in my teapot the 1st time which I discovered was way too much (tea was jet black for 1st 6 infusions). I usually take up to 4 brews of an newly purchased tea before I get the amount of tea leaves right and suitable for my personal taste. The color of the tea leaves was good with a nice pleasant aroma. There was no bitterness and the tea tasted nice. There was no new ripe pu erh scent and the description of 'good quality tea' on the wrapper seems quite accurate. I am a big fan of Haiwan pu erh teas but I will not be stocking up on this tea as I do not like to leave aside 2 g of pu erh every time I open a sachet, as storing and accumulating these minuscule amounts is unnecessarily tedious. I am also a little bit traditional.....I like my puerh to come in cakes, bricks or even a big box/bag of loose tea leaves. I had purchased this cake from my local Singapore tea shop (D'art Station at Temple street). This is a 2004 Menghai 7542 cake. Costing a hefty $120 (about US$80, bought in Oct '09), this cake is considered expensive for its age of 6 years. I was told by the tea shop owner, that this cake was brought here to Singapore in 2006 and was produced by Menghai tea factory and the traditional CNNP wrappers were used for this packaging for the last time before Menghai tea factory started fully using their 'Menghai' wrappers. The most important factor in my purchase of this pu erh cake was I had a tasting sample of the tea before buying. It tasted very much like aged pu erh. The taste was very mellow and strong. I get a little sweaty after drinking 3 fast infusions with a mild intoxicating feeling which passes in a couple of minutes. I believe that the aged taste in the tea was achieved with 2 factors. One reason could be the quality of the tea leaves which I think could be of a good harvest. The other factor was that the tea was aged in Singapore for a good 5+ years. The proper storage of this tea in this, year-round hot and very humid, climate of Singapore allowed the tea to ferment swiftly, when compared to the temperate areas or countries where you do not get hot and humid weather characteristics all year round. This tea is so much better than a similar 2004 Menghai 7542 (26 Feb'10 blog) which I had purchased earlier this year. I could get 10 delicious infusions to drink from a single brew. The color of the brewed tea is of a dark orange shade, something like the color of orange autumn leaves. The taste, unlike new raw pu erh, is not sharp or tingly but rather a mellow pleasant herb-like taste. Though I consider the price of this tea to be on the high side, this tea sells well and the shop have a few pieces left. I have bought an additional cake to add to my tea stash. I would like to reiterate that you must sample older pu erh before you purchase the tea. Older teas are pricey and not every tea will appeal to your taste buds.